A Linux subtitle editor with many possibilities, all you need is an audio wave file. Now with animation templates and subtitles for subtitler-yuv ONLY, these also work in preview. See my dvd page for more info on xste. Subtitler is a real picture composition tool! It is a 'filter' for use with the Linux transcode program. This version also will work with transcode versions > 0.6.0. Please upgrade to this version if you use a transcode version > 0.6.0!!!! else it wont work! I am NOT actively keeping up with transcode releases anymore!!!! Now with movies in movies! And you can manipulate these the same as pictures! You can make corrections to the main movie on a frame by frame basis. ssa input dropped, 100% ppml language input, extremely powerful. NTSC hue correction and dynamic line hue correction adjustable per frame! Color in text objects, dynamic change of color! Scrolling Title lists! in changing color too! Fonts can be dynamically changed per frame from the .ppml file! And with ImageMagic installed, you can resize, rotate, and shear pictures and movies dynamically! Subtitler now uses true type fonts. Use with xste-3.5.9 or later. Subtitler-yuv for use with mjpegtools! Current version is 0.6.5, audio and video editing to frame accuracy, redefinable text objects, bugfixes! Use with xste-3.5.4 or later, that version has a GUI interface with programmable animation templates. Reads yuv from stdin and writes yuv with the effects added to stdout!!! All that in mjpegtools format, just pipe your movie throught it! Subtitler-yuv uses mplayer type fonts. See the lsm file below for new features! xste-3.5 (and later) has text animation templates, and will generate complete ppml for this! so it can be used to edit. in the ppml file to cut pieces out of a n channel audio file. but one can only cut a 48000 samples / second wave file at 1 / 48000 second. With this sound utitlity added you have a 100% audio video editing facility! If you have more then one audio wave file, run 'process_wave' on each one. I have tested with 1, 2, and 5 channels at 48000 samples / second. 100% beta of cause, not tested very much. Another font for use with subtitler-yuv, from Linux mplayer. This will help you make AVI with embedded subtitles from an existing DVD or VOB. It uses vob2sub (from submux-dvd) and transcode subtitler (or subtitler-yuv). It creates .ppm files from the .bmp bitmaps, and a .ppml control file. Only tested on my own anti-aliased DVDs made with submux-dvd. The quality of the subs can be extremely good. Useful for example when subs do not need to be switched off, and OCR ripping is not working. So, the bitmaps are kept, and rendered in the output. for background transparency a slice level can be set. This also makes it possible to have subs with good outline. This will grab subtitles from (for example BBC) teletext, and make a .srt file. and use the .srt in a standalone player. resizer-yuv for use with mjpegtools. 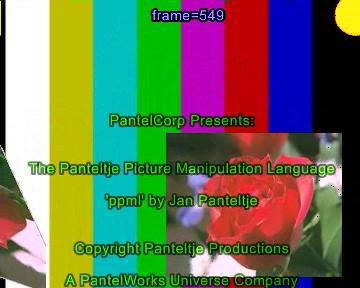 This is a resizer for 720x576 DVB-s PAL to 352x576 CVD (D2). CVD is like SVCD for playing CD-R in DVD players. use at your own risc (as always), there are still some artefacts. it uses fft and reverse fft to eliminate aliasing in the resize process. The fft is based on the fftw package. Click here for more on the filter and example pictures. xine, an AVI and mpeg player. click here to see some handy GPL programs for the Linux platform.